The year was 1995, but once you stepped over the threshold, you were in 1927. It was the first time she time traveled. That night, she danced the Charleston for an audience of strangers and from the corner of her eye caught him watching her from the crowd. The Hermitage in Hohokus was a magical place. Nine months later she traveled again, stepping out of 1996 into 1935. She left herself at the door and assumed the role of someone else for an evening... a fun and mysterious evening filled with history, mayhem and... murder. Leaning in with a curious grin, "Do you think he will be here again?" Just concentrate on this sheet, she whispered in her head, glancing over the floating words in her hands. The familiar voice prompted her to instinctively follow it... to glance at the library where he was standing in the doorway. For that moment, their eyes met. He was here... that was all she needed to know. Excitement surged through her evoking a smitten smile. The evening unfolded as expected - drama incurred, dinner was served and the mystery solved. She met up with him at the end, mother beside her, the three making familiar small talk.She didn't realize fate had sealed a deal that night. During the course of the following year, after receiving a ingenious letter of introduction from this gentleman, the two embarked on a romance. He encouraged her to time travel with him as volunteer actors in the Whodunit Mystery Dinner Series together raising funds for the preservation of the Hermitage. At the anniversary of their fateful second meeting, they stole the show at the closing of that night. To an audience of patrons mixed with good friends and her mother, he bent down on one knee to propose to her. Nothing says spring and summer like straw handbags, so of course these are coming back in style this year. Look for woven raffia in particular to make a splash this season. For real French Riviera chic, consider carrying a woven straw tote bag off the beach…and to a lunch date or shopping trip. 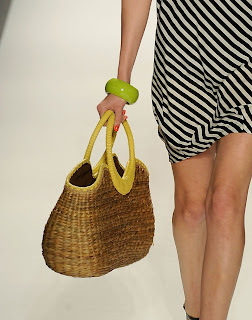 Straw totes are certainly a bag trend this season, and an easy one to pull off effortlessly! Large or small, this year’s straw handbags come in virtually every price-point, color and by most every major bag designer. The trick is to find a bag, that while it may double as a beach bag, looks more like a true handbag than just a throw-your-beach-towels-in-it tote! I was lucky enough to pick up this vintage beauty below during one of my recent shopping trips. The romantic floral embroidery and tropical inspiration brings even more summer flavor and goes perfect with casual basic looks. The rectangular form is such a retro shape as the delicate embroideries which create a sassy cute accessory for any outfit. Time to clip the beautiful pale pink peonies from my garden out front and bring them inside to enjoy. Peonies have been a treasured flower in Asia for centuries. It is no wonder when you look at this flower's splendor of delicate tissue paper petals that form the nodding head blossom. Used symbolically in Chinese art, it is considered to be a "flower of riches and honour" and represents shyness and beauty. The Chinese name for peony is 'sho yu' - meaning most beautiful. In folklore the peony was believed to have been created by the moon goddess to reflect the moon's beams during the night. During the Middle Ages 'lunatics' were covered with peony leaves and petals in order to cure them. It is considered unlucky to uproot the plant, and the seeds and dried root used to be worn as a protective amulet against evil spirits. Named after the Greek god of healing, the peony was also used extensively in medicine. Once established, a peony will grow for literally decades and may even out live you. Isn't that the type of legacy you would love to leave in your garden? Have a minute to browse?